« Sharing can be hard work! 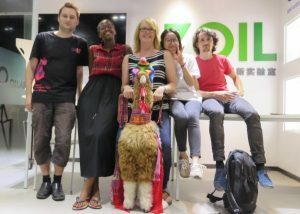 Friends from 5 Continents sharing one last evening at SZOIL after Fab 12 in Shenzhen. 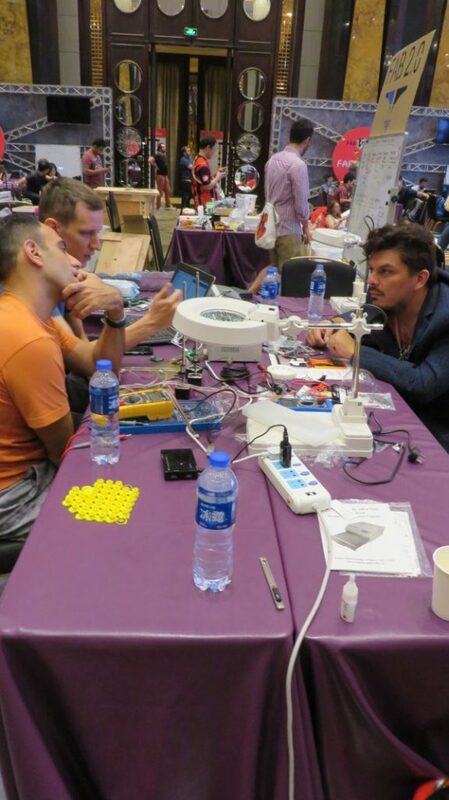 The Location: This year’s gathering of the International FabLab network took place in early August in Shenzhen, China. 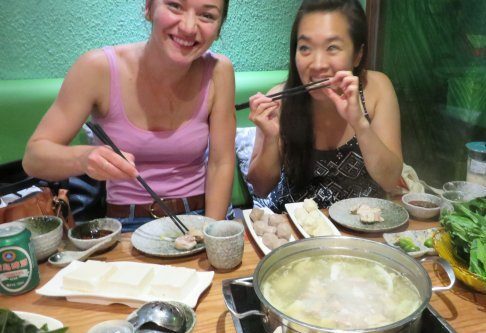 About an hour from Hong Kong, Shenzhen is a new city, grown up in the last 25 – 30 years from a fishing village to a modern industrial and commercial center. 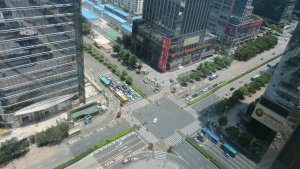 Except for the signs in Chinese characters, the view from my room on the 22nd floor of a hotel in the financial/convention district looked more like an American city than many international cities built on top of older civilizations: traffic was organized in proper lanes, turns signals flashing, horns blaring. 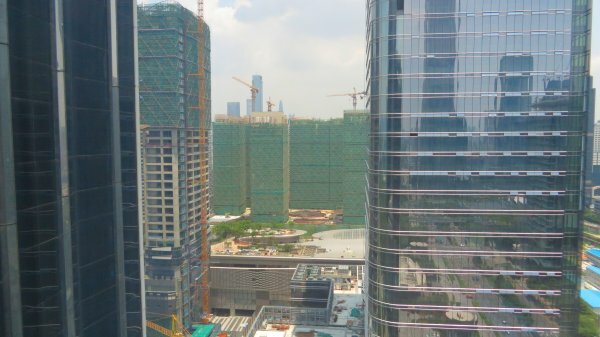 Shenzhen’s location close to Hong Kong, the numerous factories to manufacture whatever it is you need, and the amazing network of creative spaces around Shenzhen made it the perfect location to hold the meeting. Those FabLabbers with a bent towards creating their own could fill a suitcase with motors, drivers, boards, cables, or purchase real or knock off phones, cameras, projectors, and watches in the electronics markets. 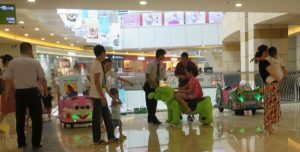 The shopping malls carried name brand clothing, shoes and purses from around the world, as well as motorized carts in the shape of animals for the kids to ride around the mall. Many malls had DIY sections, with build-your-own music boxes, pottery wheels, and painting classes. Grocery stores had Lays Potato chips bags with funny faces on them, cans of soda with the name in the familiar Coco Cola font as well as Chinese Characters, Dragon fruit, and chickens with head and feet still attached. It seems that the crane is the national bird. Adam (New Zealand) and Frosti (Iceland) explore the electronics market. Traffic in Shenzhen is orderly, though horns are in constant use. Mornings were filled with reports on the doings of FabLabs around the world, and announcements of interest to the greater community. And there is always Fabbercise, which can have its own share of familiarity and hilarity. Motorized scooter created at FabLab Hamamatsu, Japan. A ShopBot was used to cut out the MDF parts of the body. 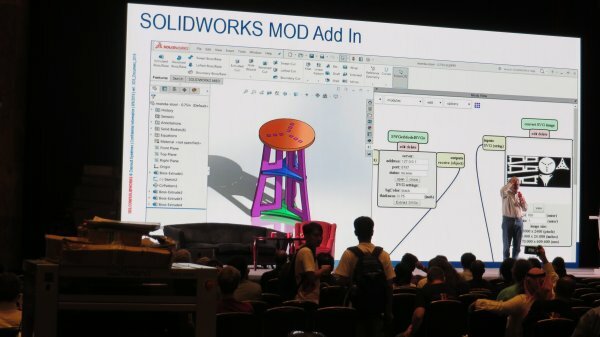 Solidworks introduces an add-in for Fab Modules, Neil Gershenfeld’s software for running digital fabrication machines in the lab. Fabbercise, led by Walter and others of the crew from Peru, weaves the audience into a web of laughter. Afternoons brought options for workshops and sessions. Want to use a laser cutter to create hats or lamps? There’s a workshop for you. Want to discuss topics in education or humanitarianism? There’s a session for you. Want to catch up with old friends and make new ones? There’s plenty of time to connect, collaborate and share. Evening meals and after gave more opportunities to learn what is happening in FabLabs around the world. There was even the opportunity to see how products developed in a FabLab can be brought to market when 3NOD, one of the event sponsors, hosted a fabulous evening at their headquarters. 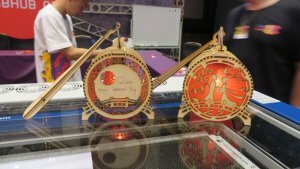 Lanterns demonstrate Chinese traditions, plus laser cutting and circuits for the battery-powered lights. Bas (Iceland), Ohad (Israel) and Jean-Luc (USA) connect over workstation for creating new digital fab tools. 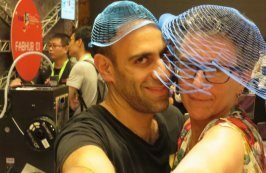 Ohad (Israel) and Wendy (New Zealand) show off hats made in their textiles workshop. 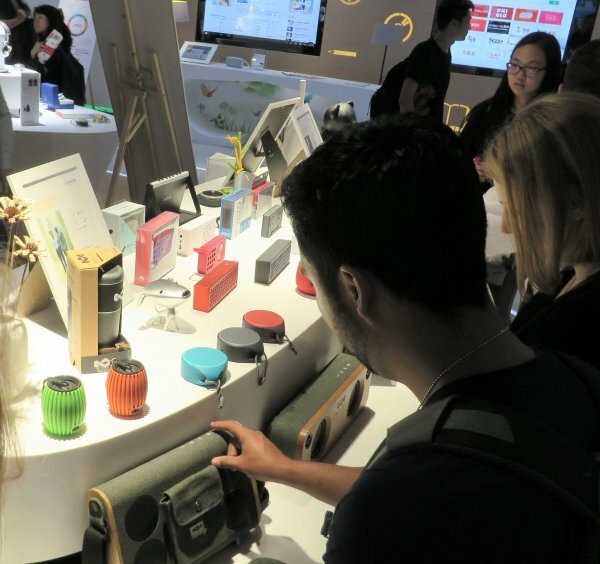 Products brought to market via 3NOD, Shenzhen. 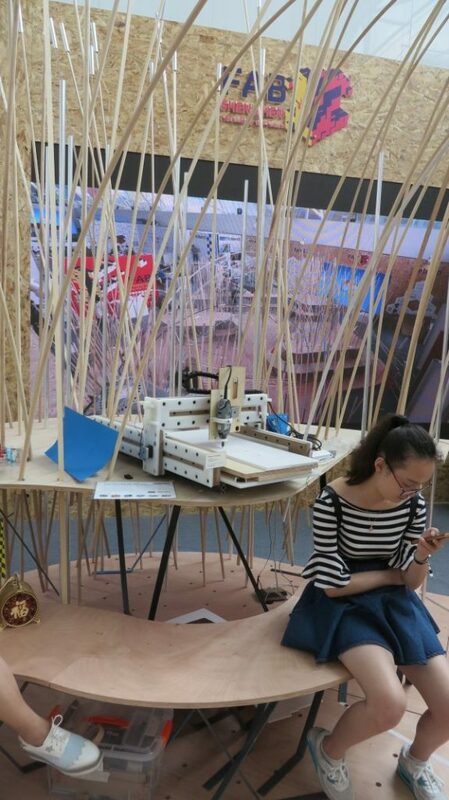 The focus of Fab12 was FABLAB 2.0, the ability of a FabLab to use its own digital fabrication tools to produce a fab lab and to produce the manufacturing machines of the future. Since the Handibot (www.handibot.com) was inspired by work of MIT students under the direction of MIT Professor Neil Gershenfeld, Center for Bits and Atoms ( www.cba.mit.edu ), it seemed only proper that a Handibot traveled to Shenzhen to take part in the festivities. Others brought their version of a digital fabrication tool created in a FabLab. 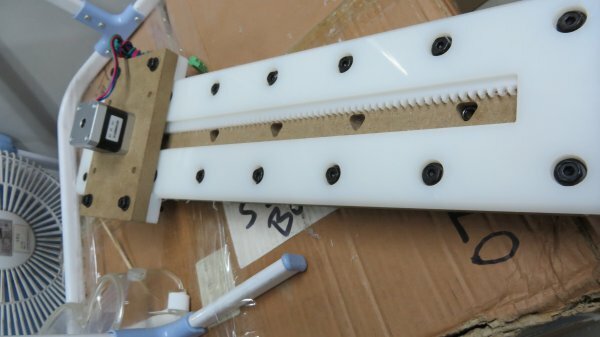 Jens Dyvik used the ShopBot in the Shenzhen Open Innovation Lab (SZOIL) to fabricate parts for his VBird parametric CNC, and Steven Sui made his multipurpose CNC machine with GCC products such as the laser cutter and CNC machine. Nadya Peek offered workshops on how to create digital fabrication tools from cardboard kits and component motors and rails. 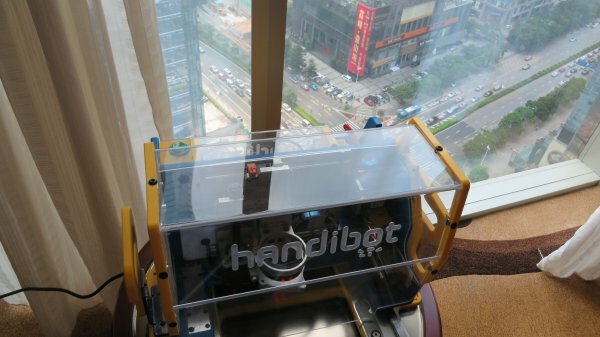 Handibot’s view from the hotel room on the 22nd floor. 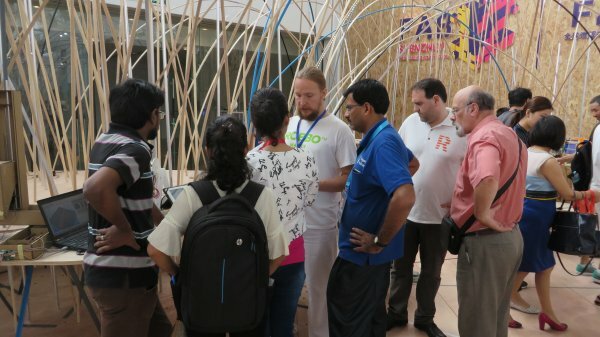 Jens Devyk (Norway) conducted a workshop on using a large format CNC (ShopBot) to create a parametric CNC from plastic and MDF. You can see a video of Jens’ VBird CNC machine and software here. Handibot with Steven Sui’s U-Bot, a small CNC with the option to change out a 600 rpm router with a laser head. Detail of rack cut on ShopBot for VBird parametric CNC. The Symposium: Friday’s symposium, open to the public, addressed 4 topics that scaled from the individual to the civilization. The Fab Festival: The weekend event, open to the public at the Civic Center, was a celebration of all things Fab. 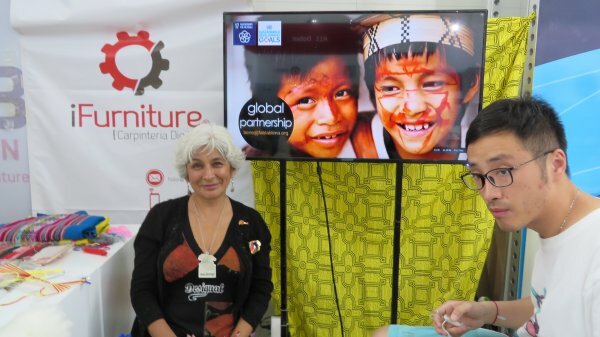 FabLabs in Peru are working with indigenous people to retain knowledge about such skills as weaving and furniture making. There is also a floating FabLab on the Amazon River. 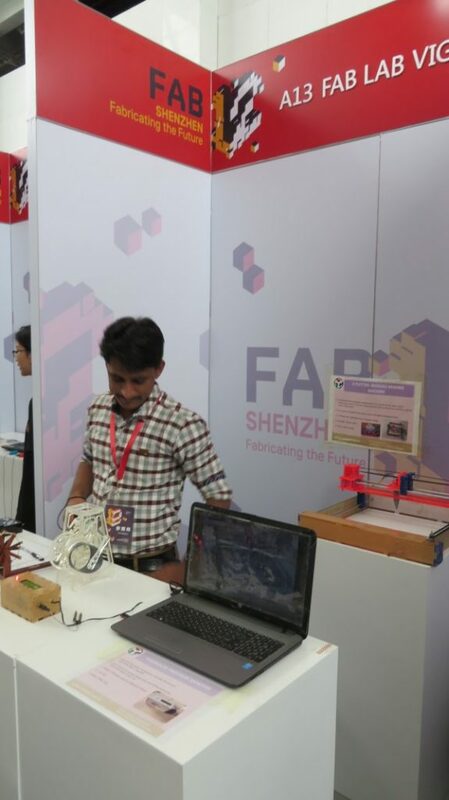 FabLabs in India range from those at an Engineering University in Mumbai to an Ashram in the country that emphasizes project-based learning. 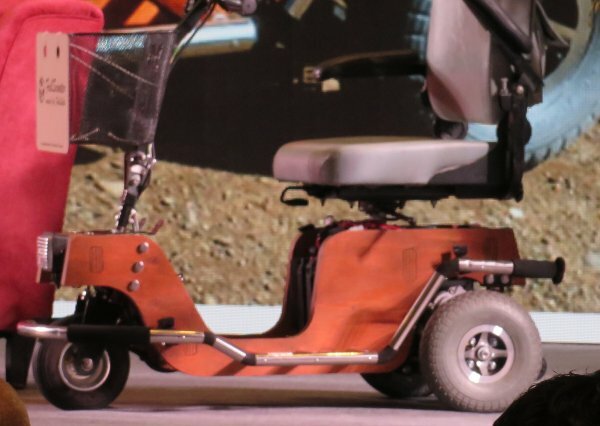 Projects include how much it costs to raise animals, or create machinery that enhances lives. In Kerula, there will be 20 mobile FabLabs distributed around the province, each with a ShopBot Desktop. Jens’ finished CNC at Fab Fest. 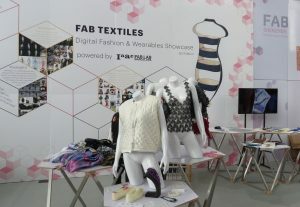 FabLab Barcelona has a strong program in textiles. Barcelona has a commitment to creating a “smart city” in which there are multiple, localized fab labs so that people can create what they need rather than import goods and export trash. Folks from France and India at Fab Fest. 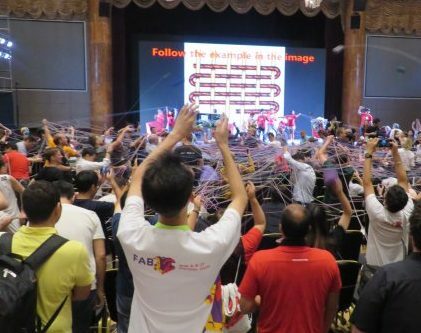 Fab 13 will take place in Santiago, Chile, and Fab 14 in Toulouse, France. ShopBot and FabLabs have had a strong relationship for a number of years. ShopBot is a CNC of choice on the official FabLab buy list, so attending the Fab meetings is an opportunity to keep up with the exciting advances that those who participate in the FabLab network are making, offer training and tech support where needed, and learn what ShopBot needs to pay attention to in order to better serve the community. After 6 years of working with FabLabs, I feel that I have a growing network of contacts that works both ways. If someone has a question, they have my direct email and a cell phone number to call. Likewise, if a ShopBot user or ShopBot Tech Support needs a local representative to serve as “boots on the ground”, I have an idea of who has ShopBot experience that we can reach out to. Our plan is to expand that network and make it more accessible…look for an update to the ShopBot website in a few months. It is always a bit surprising when someone refers to ShopBot as a “vendor”. We think of ourselves as friends and colleagues who just happen to manufacture an amazing CNC machine. Arriving a few days before each meeting is an opportunity to make new friends, pay attention to how people are actually using the machines, as well as to make sure that the local ShopBot is in proper working order for the meeting. For Fab 12, the ShopBot at SZOIL was mostly assembled, but Francisco S (Beach Lab, Sitges, Spain), Vicky (SZOIL) and I spent several hours resolving some Control Box/Spindle issues before laying down the support and spoil board. Since Francisco will be one of the trainers going to Kerala, India, to help with their deployment of 20 mobile FabLabs, he got some hands-on experience with hardware and software. 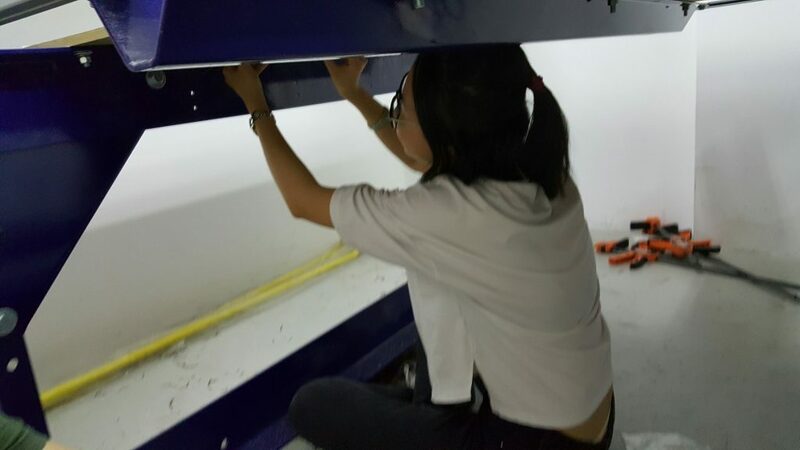 Vicky, Fab Manager at SZOIL, began to take ownership of her ShopBot when she used a ratchet wrench for the first time to tighten the hardware for the support board. 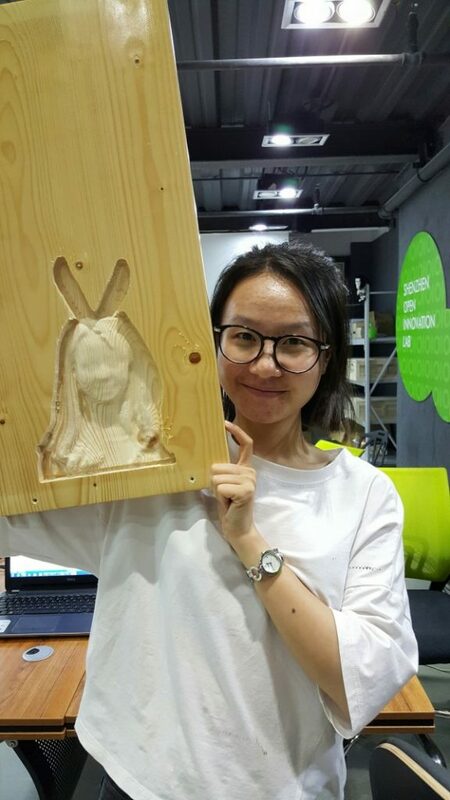 We ended the late night by taking a 3D scan that Vicky had created for printing on the 3D printer and machining it on the ShopBot. 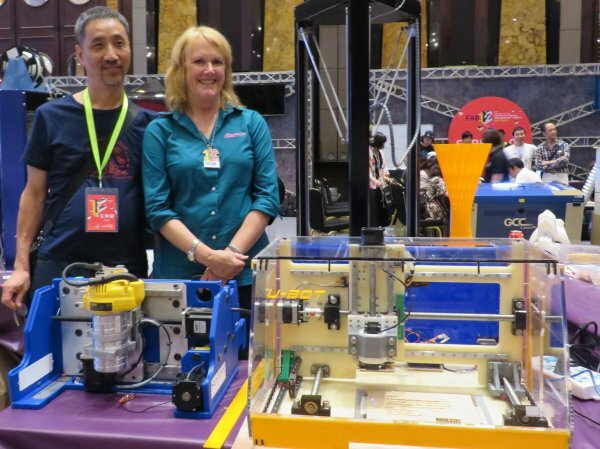 With each international trip, I learn a bit more about how ShopBot is used outside of the US. Some lessons are not related to the ShopBot itself, but point out differences in the operating language of the computer, or electricians deciding to run the power to the control box in a way that does not conform to the specs of the tool. It can be a lesson about the types of material available locally. For example, in Shenzhen, there were two different kinds of sheet goods available in the lab. While both were referred to as “plywood”, they had very different characteristics. What I would call “plywood” is made up of thin layers of wood laid down with the grain rotated 90 degrees at each layer (ply). It is less resistant to changing size as the humidity level changes, and maintains a certain level of structural when dadoes or slots are machined into it. Sheet goods that are made up of long strips of solid wood glued up and covered with thin veneer may be more consistent in thickness than plywood, but it can lose its structural integrity as soon as the thin veneer has been machined through. I have never seen this type of sheet good in the US, but have now found it in Japan, Egypt and China. Vicky, Fab Manager at SZOIL, tightening down the ShopBot support board. Vicky’s first project with the ShopBot. She added bunny ears to the original .stl created from a 3D scan, then carved it on the ShopBot with a .25 ball nose bit. See our previous blog entry for the process to convert a 3D scan to a 3D ShopBot carving. With “plywood” (above), thin layers of wood are peeled off of a log, laid down flat and laminated together. One does not have to pay attention to the grain of the sheet good when assembling cabinets or tables, since the grain of each “ply” is alternated 90 degrees to reduce the effects of changes in humidity level on size of each component. The second type of sheet good is made of up solid strips of wood that are glued up the length of the board. Note the growth rings on the edge of the board. Only a thin layer of veneer adds strength to the glue up. Creating a dado or machining a hole/slot in the material could result in compromising the integrity of the sheet good because it could weaken where the strips are glued up. There’s too much to talk about for me to put it all in this blog. Visit the Fab12 website, and look up Fab Foundation, Center for Bits and Atoms, and FabAcademy for more information on the wonderful things that are going on with the 1000+ FabLabs around the world.